Police Chief Aidan Cruz has instructed Sgt. Grace Gabbiano to find out everything she can about a body farm smack in the middle of one of the town’s largest filbert orchards, and to get it done five minutes ago. Six students, led by a teaching anthropologist from the university, seem to spend as much time making whoopee on the grounds of what they fondly call the B-Farm, as they do collecting and recording research data on the thirteen decomposing cadavers planted there. Grace barely gets her report written before a fresh grave is discovered inside the compound, and it doesn’t contain a body donated for research. With the body count rising, the pressure is on for her to find the common denominator among the victims who share no obvious thread other than being female. Coburg, Oregon, a community of around 1,000 residents, is a real town. In actuality, homicides don’t occur there; in fiction, Grace Gabbiano and her crew face murder with regularity. It’s fun creating small-town characters with a vast range of personalities. I want my readers to get a sense, not only of what it’s like to live in a small town, but also what it’s like to be part of a large Italian family. 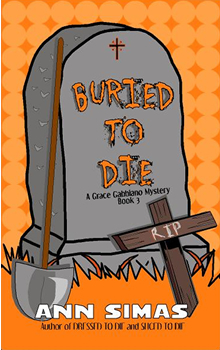 BURIED TO DIE is the third book in my Grace Gabbiano mysteries. With each book, I strive to create unique situations and characters that are engaging in their humor, quirks, and tenacity. I like to write longer, more complicated books, which are supplemented by in-depth research. I want readers to be completely immersed in the characters and the story, from the first page until the last. I want to leave them waiting with anticipation for the next book in the series. I’d heard of body farms before, but never done any research on them. It’s interesting and slightly gruesome, knowing that they exist and why, but for my purposes, a body farm was the perfect foil for BURIED TO DIE. There are so many ways to dispose of a dead body, you could never possibly imagine them all. Also, one of the characters is named after a reader who won a contest I ran last year. She said she wanted to be “naughty.” I hope she meant it. I started out as a kid reading Nancy Drew and Judy Bolton books, so the mystery genre became my favorite at an early age. As an adult, I still lean toward books with a mystery/thriller bent. I especially like those in which the author wasn’t afraid to deviate from the norm and didn’t rely on gross or graphic representations or babble on with needless narrative to tell their stories. Give me a Koontz, Gardner, O’Connell, Parrish, Slaughter, or McDermid any day and I’m a happy camper. Ann Simas lives in Oregon, but she is a Colorado girl at heart, having grown up in the Rocky Mountains. An avid word-lover since childhood, she penned her first fiction in high school. 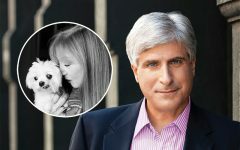 The author of 17 novels and seven short stories, she particularly likes to write a mix of mystery/thriller/suspense, with a love story and paranormal or supernatural elements. In addition to being a three-time Romance Writers of America Golden Heart Finalist, Ann is also an award-winning watercolorist and budding photographer who enjoys needlework and gardening in her spare time. She is her family’s “genealogist” and has been blessed with the opportunity to conduct first-hand research in Italy for both her writing and her family tree. The genealogy research from century’s-old documents, written in Italian, has been a supreme but gratifying and exciting challenge for her.